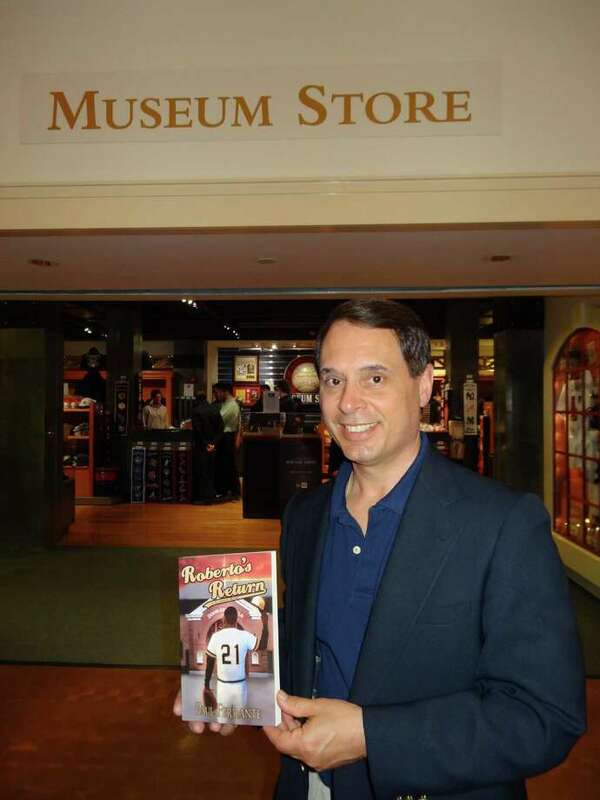 Fairfield resident and Coleytown Middle School teacher Paul Ferrante will speak as part of the National Baseball Hall of Fame's Summer Author Series on August 7. Coleytown Middle School teacher Paul Ferrante worked tirelessly over the past two years as a fictional writer, publishing a trilogy of books in the T.J. Jackson series. Ferrante's latest novel, "Roberto's Return", revolves around a trio of teenage ghost detectives -- led by title character T.J. Jackson -- who are on the case to find the spirit of legendary Pittsburgh Pirates outfielder Roberto Clemente. The journey eventually takes them to the National Baseball Hall of Fame in Cooperstown, N.Y.
Ferrante, who lives in Fairfield, will follow his protagonists to the hollowed grounds, as he was recently invited to participate in the Summer Author Series held each year at the Bullpen Theater inside the Hall of Fame. Ferrante will speak on Aug. 7 about the book and field questions. For a kid growing up idolizing the game's greats -- and the game's great writers -- the honor was deeply appreciated by Ferrante. "It's a big honor, as someone who's always loved baseball, to speak at the Hall of Fame is the pinnacle," Ferrante said. "It's a great venue; just to be among the people that spoke there, big time baseball writers. To be included with them is great." Ferrante grew up in Pelham, N.Y. and played football four years at Iona College. Ferrante was a running back who helped the Gaels to an undefeated record in 1978. Immediately after college, Ferrante began his teaching and coaching careers at Cardinal Spellman High School in The Bronx. Once his 15-year coaching career ended due to family reasons, Ferrante put down the whistle and picked up a pen. In 1991, Ferrante began writing for Sports Collectors Digest, a magazine that focuses on the history of baseball. Ferrente moved to Fairfield in 1998 and began teaching at Coleytown soon after. Ferrante finally got a break in publishing in 2013, when Midwest company Fire and Ice agreed to pick up "Last Ghost at Gettysburg", the first in the series. The second in the series -- "Spirits of the Pirate House" -- was published six months later. "Roberto's Return" soon followed and the trilogy was complete in about a year. "My head was spinning," Ferrante said. "There was so much to do editing wise, publicity wise and marketing wise. In a way they were too close together." During his time at Sports Collectors Digest, for which he still writes today, Ferrante developed an understanding for the history of the game. Along with being a frequent visitor to the Hall of Fame for research purposes, "Roberto's Return" was carefully crafted with a historical sense in mind. Roberto Clemente died at age 38 in 1972 in a plane crash off the coast of Puerto Rico. Clemente was delivering supplies to Nicaragua after an earthquake devastated its capital city. Clemente finished with exactly 3,000 hits in his Major League Baseball career and was enshrined in the Hall of Fame in 1973. "First I thought of Jackie Robinson," Ferrante said. "Even though he's one of my all-time favorites, he's kind of been done to death. But Clemente is just as compelling a figure, because of the way he lived his life." Each book in the T.J. Jackson series involves the quest to find a ghost. Unlike the first two books in the series, which were based on fictional ghosts, writing about Clemente meant paying special attention to the details surrounding his life. "For his humanitarian work in his homeland in Puerto Rico, where he was considered like a God," Ferrante said. "His body was never found, it was kind of mysterious. I realized this is going to be the guy." Ferrante hopes to continue the series with a fourth book. His business card says author and baseball historian. Thanks to his clever combination of the two, he has found himself in Cooperstown. "If you write about what you love and what you've always been interested in, it's a no-brainer," Ferrante said.